In this 1993 film by Ethiopian-born filmmaker Haile Gerima, a modern-day, fashion model is transported to the past to experience the traumas of American chattel slavery. 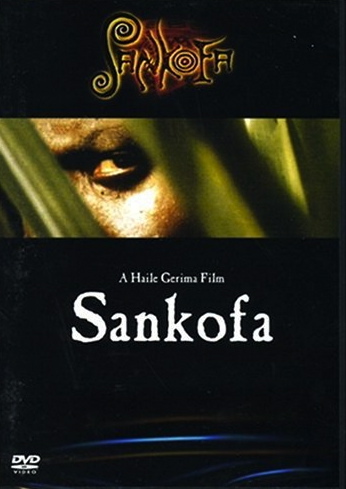 It is only through her return to the past that she can move forward, hence the name of the film, Sankofa, an Akan word meaning “go back and take” or “go back to move forward.” The film opens with a photo shoot on the coast of Ghana on the grounds of a fortification (read castle/dungeon) used to house African captives prior to being forcibly transported to new world plantations. Zola, the main character, is forced back in time to an isolated sugar plantation. There she learns the power of family, community, and even rebellion as she and other members of the enslaved community seek their freedom through solidarity and decisive action. This is the closest film rendition of slavery since the 1977 television mini-series Roots. Gerima, a Howard University professor, did much to ensure that his portrayal of the institution of slavery and the presentation of African cultural traditions were as close to reality as possible.